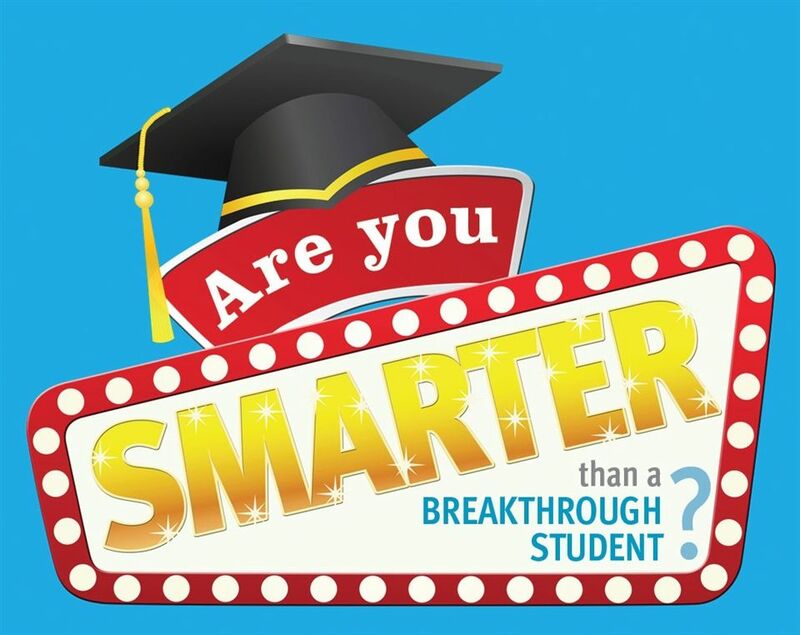 You are invited to join Breakthrough Manchester for a new and innovative event "Are You Smarter Than a Breakthrough Student?" on Tuesday, May 8 at Southern NH University Dining Center from 5:00-7:30 p.m. This is a unique and exciting event for Breakthrough Manchester, in which you can test your knowledge in rounds of trivia, enjoy great food, interact with our students, and experience first-hand the Breakthrough Manchester spirit! Come prepared to be challenged and see how much you remember from your middle and high school years. You’ll compete against other teams of adults, but don’t worry, a Breakthrough student will be nearby as your lifeline! Breakthrough Manchester is an award-winning program that provides six continuous years of tuition-free academic enrichment and support for bright students in Manchester who have limited opportunities. The Derryfield School initially established Breakthrough (originally called Summerbridge) in Manchester in 1991, and the school continues to host the summer session for middle school students on its campus each year. We are grateful for our all of our current sponsors, including our doctorate-level sponsor, Southern New Hampshire University. Other sponsors to date include: Northeast Delta Dental, NBT Bank, Morgan Franklin Fellowship, NEA-NH, Grappone Automotive Group, Primmer Piper Eggleston & Cramer PC, Keller Williams Metropolitan Realty, Eastern Bank, and Spectrum. Tickets are selling quickly, so purchase now before the event is sold out or purchase a table and invite a group friends to form a team for this fun competition. The national Breakthrough program has won awards from a number of institutions, including Columbia University, the College Board and the Drucker Institute, among others. In fact, the paid summer Teaching Fellowship at Breakthrough was named a “Top Ten Internship for College Undergraduates in the Country” by Princeton Review. Please feel free to share this information with anyone else who may be interested in supporting this program and would love to attend a fun trivia event.